This jagged white rock is Westborough quartzite, with the sharp-edged fractures that made it valuable to Native Americans for making spear points and tools. 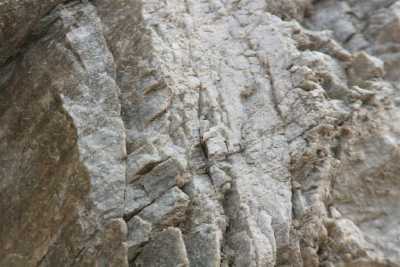 Westborough quartzite comes from the Avalon Terrane, the microcontinent that forms the eastern part of Westborough. Believe it or not, but Westborough is made up of pieces of two different continents that collided more than 360 million years ago. This news came from geologist and WCLT member Andy Koenigsberg, who gave a talk and led a walk focusing on the town's geology during Earth Week. The eastern part of Westborough is part of a microcontinent that geologists call the Avalon Terrane. It makes up much of the east coast of the US. The northern and western parts of Westborough are part of the Nashoba Terrane, which has its own complex geologic history. It is, in fact, 100 million years younger than the Avalon Terrane. When these microcontinents collided, the Avalon Terrane moved under the edge of the Nashoba Terrane Or, to put it another way, the Nashoba Terrane was thrust up over the Avalon Terrane. In effect, the collision joined the two. This collision formed a mountain range named the Acadian Range, which rose as high as the present-day Himalayas. These mountains have long since been eroded away. What we see in Westborough today are the roots of those mountains, rocks that were once buried 6 to 12 miles below the earth’s surface. The collision is marked by a suture – a joining-place – that runs right through Westborough. It is called the Bloody Bluff Fault and goes diagonally from southwest to northeast. The name comes from the fact that this suture also runs through the site of a Revolutionary War skirmish in Lexington, Mass., called Bloody Bluff. When the mighty collision occurred, today's continents were not in their present positions on the face of the Earth. At the time, they – and what is now Westborough – were in Earth's southern hemisphere. Avalon had broken off the coast of what is now Africa and crashed into what is now North America. Quite literally, the Avalon and Nashoba Terranes and their collision provided the bedrock upon which Westborough is founded. These two terranes contain different types of very old rock that we can see in town today. The Avalon Terrane, on one hand, includes Westboro Quartzite. This white quartzite is found in many parts of eastern Massachusetts. We can see it today in the newly exposed outcrop of white rock along Route 9 west where blasting was done in the construction of the soon-to-open Colonial Volkswagon dealership (next to Midas Muffler). 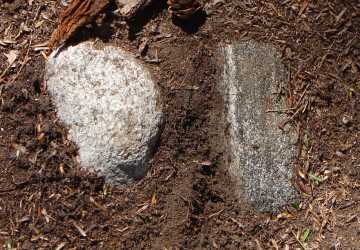 The rock on the right is gneiss, with bands of light and dark, as contrasted with all-gray granite on the left. This gneiss is characteristic of the Nashoba Terrane, the microcontinent that makes up the northern and western parts of Westborough. Native Americans prized Westboro Quartzite for their spear points. They camped in Wesborough during the summer and fall and worked it into points for tools and weapons. The Nashoba Terrane, on the other hand, contains a lot of gneiss (which rhymes with "nice"), a rock with bands of black and white. Much of this gneiss is part of the Marlboro Formation, also found in eastern Massachusetts. We can see examples of this gneiss in the Mill Pond School parking lot. Long after the Avalon and Nashoba terranes were joined, the gentle landscape in town was formed very differently and, geologically speaking, much more recently. The landscape we see today was the work of a series of continental glaciations, the last of which receded about 15,000 years ago. Most of the hills in town – including Fay Mountain,Walnut Hill, Crane Hill, and Rabbit Hill – are glacial landforms called drumlins. Drumlins are teardrop-shaped hills, with the blunt end to the north. The longer, gentler slope points to the south, in the direction of the glacier's movement. To experience this teardrop shape for yourself, walk the Charm Bracelet in the north part of town and hike the side trail over Cedar Hill in Northborough. (You'll get a fine view of Westborough from the top). The trail up the south side of Cedar Hill is much less steep than the trail down the north side. Westborough also has eskers, which are long, narrow, winding ridges of sediments deposited by rivers that once flowed under or inside a glacier. A good example of an esker is the trail from the Haskell Street ball fields to the WCLT Hero property by Orchard Swamp. Across Haskell Street, the spur of trail that goes into the hemlock forest in Crane Swamp (and ends there) is part of the same esker. What about our many swamps, which contribute to the headwaters of the Sudbury and Assebet Rivers? From a geologist's point of view, swamps are places where the underlying water table comes to the surface. This water is typically carried in underground layers of sand and gravel deposited by the glacier. Such layers underlie most of these large swamps. Many boulders of various sizes, either free-standing or partly buried, are evidence of the glacier's presence long ago. They are known as glacial erratics. The glacier carried these boulders along and dropped them when the ice finally melted. There's a large glacial erratic near the beginning of the Westborough Golf Course, for example, from a rock formation found many miles north of Westborough. You can see several erratics in the woods along the Charm Bracelet trail to the Assabet River from Osprey Point in the Headwaters Conservation Area. There's more to the story! If you are interested in learning more and finding out what else to see, look for "Highlights of Westborough's Geology" by Andy Koenigsberg, coming soon to the WCLT web site.